Gang of Littles is a Bollywood Hindi movie. Gang of Littles is a Drama film. 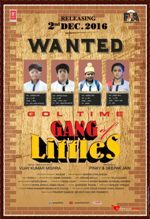 You can watch full HD Indian movie Gang of Littles online or in cinema after its release date which is 16 December, 2016. Roshni Waliya, Krish Sharma, Vinay Sachdeva. The Story of 4 Innocent kids who are common but there thinking is different from other's. They have aspiring dream to become scientist but ignorance of their parents guidance they commit something which is unthinkable by any one .